There are a number of physical objects that play a pivotal role in the day to day operations of the average hospital. Beds, medical instruments, medications and equipment are all essential elements of ensuring that everything goes off without a hitch, but there's one thing that isn't typically associated with hospitals and that is paper. Oftentimes paper is one of the most vital elements keeping a hospital running as smoothly and as efficiently as possible. Unfortunately, with accumulation of medical records, registration forms and the like, hospitals are finding themselves faced with the task of adapting to the increasing need for space and time. Until recently, Saint Michael's Medical Center had been relying on the use of paper to document all patient visits, storing all of their records in what seemed like endless walls of shelves and filing cabinets. Office workers spent up to 60% of their time preparing, handling, filing, copying and faxing documents, decreasing productivity. 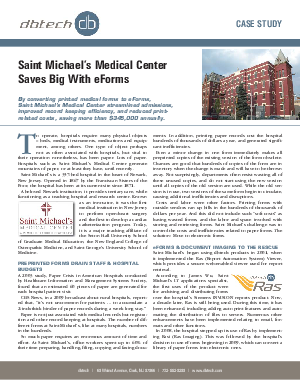 But by converting printed medical forms to eForms using dbtech, Saint Michael's Medical Center streamlined admissions, improved record keeping efficiency and reduced print-related costs, saving more than $345,000 annually.